I piled the boys' plates with food so I could run up and vacuum a room or two while they ate. Just before I darted upstairs, the contractor called me into the construction zone. He wanted to review a few things. Which way did I want my fridge to open? Where did we want the grill to be installed on the deck? Then came the moment that I am all to familiar with after viewing various HGTV home improvement shows. Kitchen with the bump out. Lots of work to be done! Our scenario is not quite that drastic. Still, it's a problem. About 6 or 7 years ago, we renovated our two second floor bathrooms. Our master bathroom was insanely large and monopolized by the world's more enormous whirlpool tub- surrounded by wall to wall mirrors where my self esteem was lowered a bit every day as I saw everything each time I took a shower. I often bathed all 6 kids or at least 5 of them in that tub, but otherwise it served no purpose. 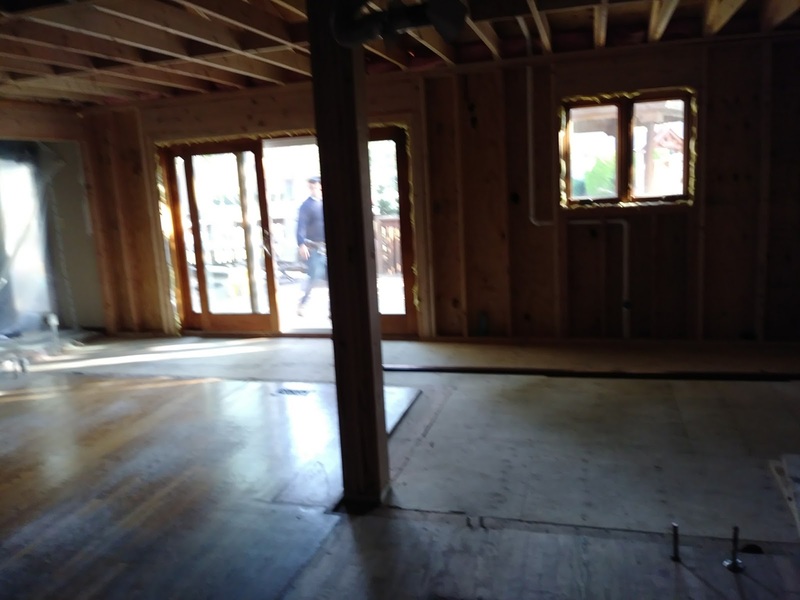 We decided to install a second floor laundry room in the space created by reworking the two bathrooms. 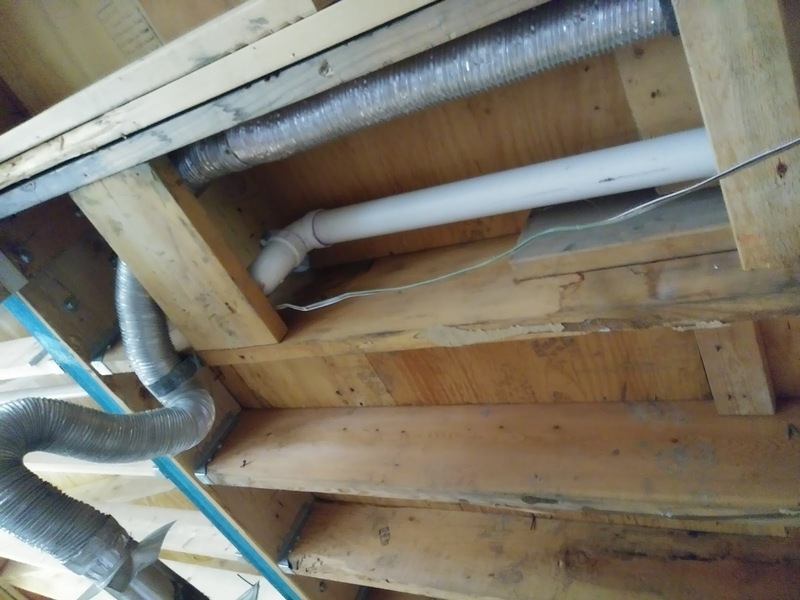 Have you ever seen an un-vented pipe? Turns out the guy who did the work (um, he's my brother's friend thru Irish music. This guy, who I will refer to as Mr. O'Cut Corners, is from Ireland. He builds homes in an affluent Chicago suburb) didn't bother to do any of the plumbing to code. 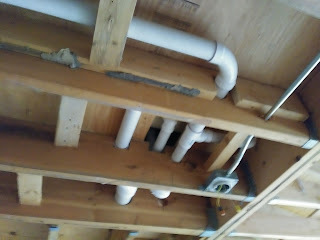 None of the pipes have been vented. The current crew can fix it, but not for free. They informed me that the inspectors might or might not require it to be fixed. I feel like it would be dumb not to fix it since the ceiling to the kitchen is open at the moment. Of course, it would mean that walls in the bathrooms would need to be ripped open. Lots of pipes are exposed now with the kitchen is ripped open. Good thing there were no cameras here for my 'we have a problem' moment. I didn't cry. Or swear (which if you spend any amount of time with me, you will find amazing). I just held my hands up to my face. Massaged my temple. Tried to imagine telling Coach this one. While also trying to imagine being without a bathroom, or two, or a laundry room if the construction zone widened to include those areas upstairs. I'm not a big Facebook user. Ironically my phone sent me a little notice yesterday morning. It wanted to suggest that I become friends with Mr. O'Cut Corners. I will tell you what I didn't add to my joke-of-an-agenda: friending Mr. O'Cut Corners. Oh no! The fact that he builds homes for a living makes it even worse! getting what you pay for/overcharged for?